‘Tyag diwas’ which was organised today to mark Congress chief Sonia Gandhi’s birth anniversary at Tau Devi Lal Stadium of Gohana in Sonepat district expectedly turned into a show of strength of Rohtak MP and former state Congress president Bhupinder Singh Hooda’s faction. 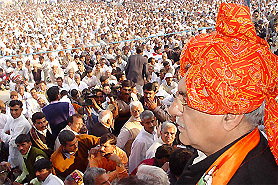 Congress leader Bhupinder Singh Hooda addresses a rally at Gohana on Thursday. The INLD MP, Mr Ajay Singh Chautala, said today that the appointment of Mr Randip Singh Surjewala as working president of the Haryana Pradesh Congress Committee would lead to factionalism in the state Congress. Congress leaders took a vow today to oust the Indian National Lok Dal Government from the state and to bring in politicians with a clean image in the forthcoming elections to the state Legislative Assembly. A local panchayat, with the consent of a prospective bride’s family, has decided to cancel her proposed marriage following a demand of dowry. The matter has been reported to the police even as efforts are on to resolve the issue. The increasing number of unemployed graduates and postgraduates notwithstanding, there are not many takers for hundreds of jobs of Punjabi teacher in government schools or loans which various nationalised banks have to offer to youth of Haryana. The Haryana Government today admitted shortage of urea in the state when it urged the Central Government to direct the Indian Farmers Fertiliser Cooperative Limited and Krishak Bharati Co-operative Limited to supply at least 90,000 metric tonnes of urea to the state cooperatives during this month. The Chief Minister, Mr Om Prakash Chautala, went on a project inauguration and stone laying spree in the district today. He inaugurated projects costing Rs 8 crore and laid the foundation stones of projects estimated to cost Rs 7 crore. The Haryana Government has decided to grant dearness relief (DR) to its pensioners and family pensioners with effect from July 1, 2004. Apparently with the approaching Assembly elections in mind, the Haryana Government has started making efforts to placate the state employees who are in a struggle mode. The government invited representatives of the Haryana Karamchari Mahasangh for talks in connection with the demands of the employees. The Haryana Public Service Commission has postponed the interviews for the posts of Medical Officer (HCMS-II) scheduled to be held from December 13 to 17. The five-day-old strike by the postal employees was called off here today following the intervention of the Deputy Commissioner, Mr Vidya Dhar, at the instance of Mr H.N. Tiwari, Superintendent of Post Offices, Sonepat. The application for anticipatory bail filed by a former Haryana Minister, Mr Kartar Singh Bhadana, will come for hearing before the Special Judge, CBI, Ambala, Mr M.M. Sharma, tomorrow. Angry over an accident in which a youth had suffered serious injuries at the local railway station, hundreds of residents today held up Shriganganagar-bound Intercity Express for about an hour. There months after the clubbing to death of 60 monkeys in Chang village of Bhiwani went unnoticed, the Haryana Wildlife Department has gathered cudgels to pursue the case on its own. The area near the main bus stand in Ambala Cantonment presents a sorry picture not only to those who alight there but also to travellers passing through. A scintillating performance was given by students of Riverside DAV Public School, Ambala Cantonment, at their annual day function here this evening. While most of the speakers at the rally presented Mr Hooda as the future Chief Minister of Haryana, he himself indicated about that in his speech. Factionalism again came to fore in the Congress during the rally as none of the prominent leaders from the faction of President Bhajan Lal and former state Congress chief Chaudhary Biredner Singh turned up. All-India Congress Committee secretary Shakkeluzzaman Ansari, along with 11 state MLAs and several former ministers attended the rally. Addressing the gathering, Mr Hooda said there was a need to change the system instead of faces in the Haryana Government to eradicate corruption and for that an honest leader was required as Chief Minister of the state. If the Congress came to power, its high-command would appoint that person as Chief Minister who was honest and whose image was clean as it had done while appointing Manmohan Singh as Prime Minister. He claimed that he had been working honestly since his beginning in the politics and asked the gathering to unite to make an honest man Chief Minister of the state in the coming Assembly elections. Mr Hooda said no one could own the legacy of Sir Chhotu Ram with merely bringing his relics from Pakistan or being his relative but there was need to adopt his thoughts in real life. He claimed that he was making an attempt to do so. The Rohtak MP lashed out at the Chautala government for its alleged anti-people policies in general and anti-farmer policies in particular. Reminding the gathering of firing on farmers during the Chautlala regime, he said the farmers had to sell their paddy at much lower price than fixed due to alleged connivance of Mr Chautala with private purchasers. He further alleged that Mr Chautala had not fulfil any of his poll promises. Dr Ansari asked congressmen to remain united in the coming Assembly elections. Dr Raghubir Singh Kadian, Mr Rajinder Singh Bisla and Mr Dariyav Singh Rajora presented Mr Hooda as future Chief Minister. MLA Anita Yadav lashed out at the INLD government. Sonepat district Congress President and MLA Jintender Singh Malik, Mr Devraj Dewan, Mr Sher Singh, Mr Dariyav Singh, Mr Dharam Pal and Mr Moola Ram, all MLAs, also criticised the Chautala government for its alleged anti-people policies. The INLD MP, Mr Ajay Singh Chautala, said today that the appointment of Mr Randip Singh Surjewala as working president of the Haryana Pradesh Congress Committee would lead to factionalism in the state Congress. He was talking to mediapersons at the residence of INLD (Women Wing) president, Ms Krishana Poonia. Mr Chautala said the appointment of Mr Surjewala means that the existing president Mr Bhajan Lal was not a working president. It also meant that the Congress High command did not have faith in Mr Bhajan Lal. Congress leaders took a vow today to oust the Indian National Lok Dal (INLD) Government from the state and to bring in politicians with a clean image in the forthcoming elections to the state Legislative Assembly. This was announced at a rally held here to celebrate the 58th birthday of Congress President Sonia Gandhi today. The party will also approach the judiciary to halt the process of conducting the panchayat elections just ahead of the Assembly elections as it would affect free and fair conduct of Assembly elections. In an altogether different show in which thousands of Congressmen danced to the tune of “Hum Honge Kamyaab Ek Din” senior leader Chaudhary Birender Singh was openly projected as the future Chief Minister of the state. The Secretary of the All-India Congress Committee (AICC) and second-in-command as in-charge of the party affairs of the state, Mr Vivek Bansal, praised the leadership qualities of this Jat leader and said he was the only one who could oust corrupt politicians in power in the state and bring in a clean administration. He appealed to the people of the state to join hands with Chaudhary Birender Singh and pave way for the dawn of a new era in which policies and programmes of the government would be framed as per the wishes of a common man. Speaking on the occasion veteran Congress leader Chaudhary Khursheed Ahmed, former Speaker and MP Sardar Tara Singh Sandhu, former ministers Kunwar Ram Pal, Chaudhary Attar Singh Saini, Krishna Gehlot, Ram Kishan Bairagi, many former MLAs and other senior leaders praised the leadership qualities of the Jat leader and appealed to the people to strengthen his hands in the coming Assembly elections. Lashing out at the Chief Minister, Mr Om Prakash Chautala, Chaudhary Birender Singh said corruption had reached its zenith during his rule. The law and order situation had also deteriorated, he said. He appealed to the Governor to dismiss the INLD Government so that free and fair elections to the state Assembly could be conducted. Congress President Sonia Gandhi’s birthday was celebrated by the Congress activists here today. A programme was organised by Mr Ashok Jain, president, District Congress Committee, Ambala Cantt, at the school for the deaf. Sweets were distributed among the students. A cultural programme was presented. Mr Lal Chand Saini, a local resident, had fixed the marriage of his daughter with the son of Mr Prithvi Singh of Hansi. All arrangements have been made for the marriage, which was to be held on December 12. Even the invitation cards had been distributed. On December 2 Mr Saini got a telephone call from the prospective groom’s father, who allegedly asked him to spend Rs 9 lakh on the marriage ceremony. Shocked at the demand, Mr Saini, along with the mediator, went to see Mr Prithvi Singh. There, the boy’s father allegedly demanded Rs 7 lakh in cash. When Mr Saini expressed his inability, the boy’s father allegedly abused and told to marry his daughter to somebody else. Following this, Mr Saini approached the Saini Sabha, which called a panchayat to decide the matter. The girl’s father narrated the entire incident before the panchayat. Neither the prospective groom, nor his father, was present on the occasion. The panchayat ordered social boycott of Mr Prithvi Singh’s family. It, with the consent of Mr Saini’s family, also ordered the cancellation of the proposed marriage. However, efforts are still on to resolve the issue. Talking to The Tribune, Mr Saini confirmed that he had broken the marriage of his daughter following demand for dowry. He said he was forced to take the extreme step due to the stance of Mr Prithvi Singh’s family. Randhir, to whom the girl was supposed to marry works as a schoolteacher, he added. Mr Attar Singh Ahlawat, SP, when contacted, said the aggrieved party had lodged a complaint and added that appropriate action would be taken in this regard. Yesterday, Chief Minister Om Parkash Chautala announced that Punjabi teachers would be recruited for each and every school as the state has amended the Official Language Act to declare Punjabi as second language. But there are hardly any Punjabi teachers available in Haryana. The reason, says Mr Didar Singh, an elected member of the Shiromai Gurdwara Parbandhak Committee from Haryana, is that there has been little or no teaching of Punjabi in the state for the past several years. All junior basic teachers (JBTs), basic teachers (BTs), Bachelor of Education (B.Ed) and other streams could not opt for Punjabi as teaching of this language remained discontinued for a long time. It is intriguing that now when the state wants to give Punjabi its due, there are no takers for the positions available. If the government, he says, is sincere in making Punjabi teachers available in all schools, then it will have to look outside Haryana to recruit qualified people. Other employment opportunity going abegging is the Central-sponsored scheme for agriculture graduates. While nationalised banks propose to set up 190 agriclinics or agribusiness centres in all 19 districts of the state by offering easy loans to agriculture graduates for running these centres, so far only eight youths in Hisar have benefited from this Central Government-sponsored scheme. Under the scheme, graduates in agriculture or related fields are given free training for two months for setting up agriclinics or agribusiness centres and provided an easy loan upto Rs 10 lakh for setting up their own enterprise or professional extensive service centre for farmers. Mr B.P. Chopra, General Manager of Northern Zone of Punjab National Bank, says that inspite of attractive features of the scheme, banks are experiencing difficulty to get agriculture graduates. “Everyone wants a government job and not his own entrepreunership. “Target of financing 10 agriclinics in each of 19 districts in the state is not proving easy,” says Mr Chopra, revealing that in Hisar, which was chosen as pilot district, only eight had evinced interest in the scheme. The Haryana Government today admitted shortage of urea in the state when it urged the Central Government to direct the Indian Farmers Fertiliser Cooperative Limited (IFFCO) and Krishak Bharati Co-operative Limited (KRIBHCO) to supply at least 90,000 metric tonnes of urea to the state cooperatives during this month. The state also reminded the Centre to review its partially regulated policy of urea so as to bring it under the ambit of Essential Commodities Act. In a demi-official letter addressed to the Union Food and Agriculture Minister, Mr Sharad Pawar, the Chief Minister, Mr Om Prakash Chautala, while appreciating the cooperation extended by his ministry in the supply of DAP fertiliser, drew his attention towards the fact that as against the total requirement of six lakh metric tonnes of urea in the state till December-end, only 4.04 lakh metric tonnes of urea had been supplied so far. Mr Chautala added that this deficit was with the state cooperatives. Therefore, private traders might exploit farmers and sell the fertiliser to them on a higher rate. Though the state was keeping a close watch over the situation, sometimes unscrupulous elements managed to indulge in malpractices. Mr Chautala, therefore, urged Mr Pawar that IFFCO and KRIBHCO be asked to supply 45,000 metric tonnes of urea each to meet the requirement of the farmers. The first halt during his tour was at Shimli village where he inaugurated a Rs 52 lakh waterworks which would supply drinking water to about 2,000 residents. Next he laid the foundation stone of a Rs 70-lakh primary health centre. Thereafter, he came here and laid the foundation stones of the third phase of the Mini Secretariat and the litigants’ shed in the judicial complex. Mr Chautala also inaugurated the War Memorial and the Campus Community Club on the Maharshi Dayanand University campus here. He then proceeded to Kalanaur where he inaugurated a waterworks built at a cost of Rs 2.13 crore. At Mokhra village he inaugurated an irrigation minor which had cost Rs 1.2 crore. He also inaugurated a waterworks at Samain, Lakhan Majra and Kharak Jatan villages. At Lakhan Majra he also laid the foundation stones of a primary health centre building and the centre for the mentally challenged persons. He laid the stone of an Industrial Training Institute at Garhi Sampla village — the birthplace of the late Sir Chhotu Ram. At Sampla he inaugurated Arpan Centre for the mentally challenged. While stating this here today, the Finance Minister, Prof Sampat Singh, said the DR would be paid at a uniform rate of 14 per cent of the revised pension or family pension so as to compensate them for the rise in the cost of living. Mr M.L. Sehgal, general secretary of the mahasangh, said here yesterday that the talks of their representatives with administrative officers were held in the presence of the Finance Minister in Chandigarh on Wednesday. An official spokesman said here today that interview of the candidates of general category bearing roll numbers from one to 105 would now be held on December 22 and those bearing roll numbers from 106 to 219 on December 23. Similarly, the interview of the candidates bearing roll numbers from 220 to 326 would now be held on December 24, candidates with roll numbers from 327 to 435 on December 25 and those of bearing roll numbers from 436 to 461 on December 27. He said that the interview of all the candidates of reserved categories (Scheduled Castes, Backward Classes, ex-servicemen and dependents of ex-servicemen) would be held on December 27. According to official sources, Mr Tiwari called on the Deputy Commissioner last evening and apprised him of the police action in arresting Mr J.K. Mehra, Assistant Postmaster, of the Head Post Office, in connection with the Manohar Kumar cheating case and going on strike by the postal employees in this city and other parts of the district. Meanwhile, the police broke opened the almirah kept in the office of the Friends Investment Company owned by Manohar Kumar, in front of the Head Post Office here last night and took into possession all the documents found in it. A chargesheet has been filed by the CBI against Mr Bhadana and others accusing them of carrying illegal mining in the Ishaq Mandi area of Faridabad district. Mr Bhadana’s control over the area has been directly proportionate with the rise and fall of his family’s political power. According to sources in the Haryana Mining Department, Mr Bhadana first applied for mining leases in Anangpur and Pali villages of Faridabad district in 1980. The state government rejected his applications in 1982 on the plea that it wanted to give these areas to the Haryana Minerals Limited (HML), a public sector undertaking, for mining. The Central Government remanded the case to the state when Mr Bhadana went in an appeal under the Mines and Minerals(Research and Development) Act, 1957. The state sought permission of the Centre to give preference to HML over Mr Bhadana, who had applied before the state undertaking. The Centre’s permission in this regard was challenged in the Delhi High Court, which issued orders to maintain status quo. In 1988 when Mr Bhadana’s younger brother, Avtar, was made a minister without being an MLA by the then Chief Minister, Mr Devi Lal, the state’s Advocate-General admitted Mr Bhadana’s preferential right before the High Court. Mr Bhadana got the mining lease of the Ishaq Mandi area in Anangpur village as well as in Pali village in 1989. However, the Union Ministry of Mines exercised its powers suo motu and stayed the lease in May, 1989. The case again went to the Delhi High Court which ordered that no orders adversely affecting the interests of Mr Bhadana should be passed. Though the Union Government set aside the lease given to Mr Bhadana in 1991 and directed the state to either give it to the HML or invite fresh applications. In view of the High Court orders, no action was taken on this direction. Mr Bhadana became an MLA in 1996 on the HVP ticket. He filed an affidavit in August, 1997, stating that he had no objection if fresh applications were invited. However, when a large number of applications were received by the state, he withdrew his affidavit. The notification inviting fresh applications was withdrawn. After Mr Bhadana played an important role in installing the Chautala Government in 1999, he gave in writing to the department that he had no objection if a short-term mining permits were granted. The sources say permits were given to a close relative of Mr Bhadana. A team of railway TTEs raided 2 DJR passenger train in the morning. During the raid a daily commuter, Sanjay of Nai Basti here, fell while boarding the train and sustained serious injuries in his leg and head. Sanjay, however, alleged that one of the TTE pulled him out of the running train and he fell on the track. In the meantime, hundreds of residents gathered on the station and blocked the rail traffic. The monkeys were clubbed to death by residents of Chang village, and the police has failed to book those involved in the “massacre”. The Wildlife Department has decided to act on its own. Afraid that the accused would go scot-free, the Wildlife Department yesterday issued instructions to its staff in Bhiwani to identify the accused on their own, prepare challans and present these in the environment court in Kurukshetra by the end of this month. Officials in the department inform that since the decision to kill the monkeys was taken in a general meeting of the villagers on August 28, the support of the panchayat could not be ruled out in executing the mass killing of monkeys. Pot-holed roads, vegetable and fruit rehris, stray cattle and haphazardly parked tractor-troilers cause traffic bottlenecks. Besides, there is no cleanliness there. The bigest problem is that of rehris, which encroach upon the road leading to the main bus stand. The rehris are parked on the main road which hardly leaves any space for Roadways buses and other heavy vehicles. The rehris are causing a loss to the state exchequer in liew of fees within the Subzi Mandi, located adjacent to the main bus stand. Local residents claim that vehicles surreptiously unload goods outside the Subzi Mandi, which are carted off by the rehris so that they do not have to pay the fees. Another problem is the potholed road leading to the main bus stand. The road is in urgent need of repairs. While repairs had been carried out a few months ago, things are back to the same. The menace of stray cattle can be witnessed near the bus stand. The problem is acute in the morning when tractor trailers loaded with farm produce are brought in for weighing at the ‘dharma kanta’. Cows roam around in the area and pose a risk to the traffic. There have been numerous instances of two-wheeler drivers meeting with accidents during night. Haryana Governor Dr A.R. Kidwai was the chief guest. Speaking on the occasion, he said, “A nation is made great by its people and students are the future of any nation. If students are laborious, honest, sincere, punctual, they will prove ideal citizens and an asset to the nation”. He said all students should take education as their first and foremost mission. “Education helps students improve their mental and productive capacity and to train themselves to be self-dependent,” he said. All students should have thirst for knowledge and they should respect their teachers, he said. The annual report presented by the school Principal, Ms Punita Nehru, highlighted the academic and co-curricular achievements of students at district, zonal and national level. The programme began with students paying obeisance to goddess Saraswati. Wtih the underlying theme of the function being ‘DAV world tour — a cultural collage’, the students presented items from different regions of the world. Dressed in bright kimonos, students of the middle wing danced to the Japanese tune that reflected the culture of the land of the Rising Sun. The item was choreographed well and it enthralled the audience. It was followed by `Spanish dance’ in which the dancers brought out the underlying Spanish spirit through foot tapping numbers. Grimm’s fairy tale, `The Sleeping Beauty’ was beautifully enacted by the students. The play emphasised the message of how modern Indian woman faces social stigma with confidence. The students also performed a tribal dance. “Zelda the Zebra”, a musical drama presented by the tiny-tots, won the hearts of the audience. The young performers showed the predicament of a zebra that loses its stripes. It ultimately gets back its stripes after a hectic search. “Aa se amma” was presented by the primary wing students who stressed on the importance of the national language Hindi. The colours of festivity through Garba and bhangra were particularly liked by the people. Dr Kidwai awarded medals, trophies and certificates to meritorious students excelling in academics, sports and cultural activities. The prize winners in sports category included Navroop Kaur, Charu Jain, Lukshveer Shukla, Sahil Jain and Anjali Saini. The prize winners in academics included Anish Mittal, Umang Bharti Makkar, Ritika, Preeti and Aman Aggarwal. Kendriya Vidyalaya No.2 organised its annual sports meet on its premises today. Air Cmdr L.K. Malhotra, Air Force Station, Ambala, was the chief guest. School Principal R.V.S. Shishodia presented an account of sports activities and the achievements by school students. About 400 students participated in an impressive march past. The students from primary and secondary sections presented PT, dumb bell, yoga and pyramids shows. A cultural programme was also held. The students participated in 100 m, 4x100m relay, skipping, three-legged, balloon and pitcher races. School Vice-Principal Asha Sachdeva proposed a vote of thanks. Robbers looted over Rs 2 lakhs from a yarn factory of Jagdish Bathla here last night and fled after committing the crime.